I have another fun craft today! This one is perfect for curious toddlers. Harry loves playing with the magnets on our fridge. I'm all for exploring, but most of our magnets were holding important papers so I put them all out of reach. Obviously that didn't fly, so I came up with a solution- Harry's very own magnets. I chose to do all different shapes, but these would be really cute in letters and numbers, too. Shape/letter/number templates (I downloaded mine from scrapbookscrapbook.com). And here's how I made them. Using a Sharpie, trace shapes on to felt. You'll need two of the same shape per magnet. Then cut out the shapes. Add a ribbon of craft glue around 75% of the shape's border. Adhere second shape to create a pocket. Let dry. Stuff pocket with polyester fiberfill and one magnet. Sew an overcast stitch with embroidery thread all around the edges to close the pocket. 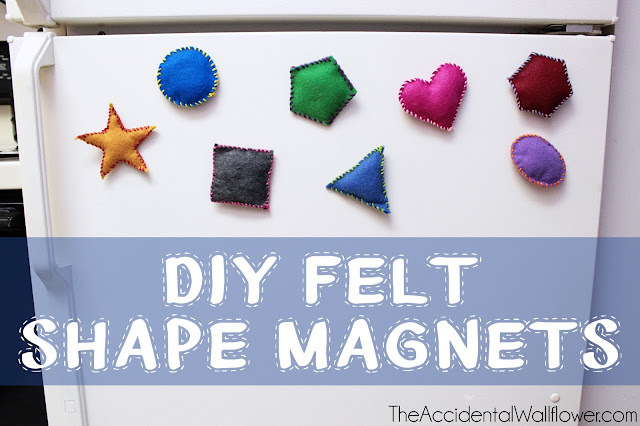 Put the magnets on the fridge and watch as your toddler explores and learns! Harry was intrigued with the magnets, but of course they all ended up on the floor. Oh well, all little boys like to do that kind of thing, right? As he gets older we'll use them to help learn shapes. great idea! I love that you made them! I bet Harry is going to have a lot of fun with those!